On Friday, July 14, 2017, a high-rise building fire in Honolulu, Hawaii, spread from one unit to additional units and threated engulfing the entire building after a fire broke out in one unit on the 26th floor of an apartment building. At least 3 casualties and over a dozen injuries have been reported so far. 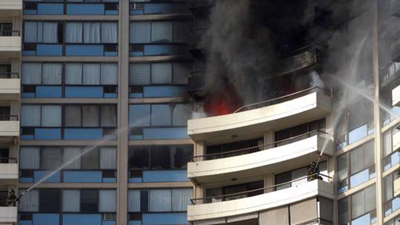 The expansion of the fire beyond the source was believed to have been the result of a building that was built in 1971, before sprinklers were required in such type of buildings, that has never been upgraded. Many residents reported no warnings or alarms either and most said the smoke was what alerted them to the conflagration. Honolulu Mayor Kirk Caldwell stated “residents have to pay” if they want sprinkler safety protection, “It’s pretty expensive. But if it saves a life and it’s your life, it’s worth the cost.” Many local ‘rumblings’ indicated there are others that disagree and it seems possible the rules will soon be looked at to see if is possible to require such upgrades. Most residents also indicated there were no fire safety meetings or drills they could remember…since a few after the last fire in 2003. Many residents, as reported by several local TV stations, were unaware the building had no fire sprinkler system and had never heard of any meetings or drills relating to emergency situations. The fire burned for around 4 hours and was mostly confined to 2 floors, due to the quick reactions from the approximately 100 fire fighters that responded to the blaze. According to the National Fire Protection Association (NFPA), there was an 80% lower risk of death and a reduction of 71% in property damage costs in buildings equipped with fire sprinklers vs. those without, between 1996 and 2001.